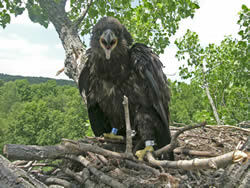 The young will stay in the nest about 11 to 12 weeks. At the end of this time the adults will start encouraging them to fly. As fledging time approaches, adults may start withholding food, perching with food near the nest, or flying over with food to tempt the nestlings to fly. 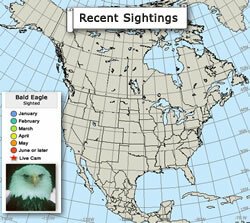 Adults may also encourage nestlings through vocalizations and low circling over/around the nest. When hungry, thirsty, or confident enough, the nestlings fledge. Once an eagle has taken a flight, it enters the fledgling phase of development. For the first 6 weeks, it will stay close to the nest site and the parents. It may still return to the nest. The young birds follow their parents on hunting trips during this time. Then the fledglings begin to wander further from their nest area.